The New England Patriots have done the whole “open the season at home on a Thursday night” thing. They’re used to being defending champs. The NFL switched it up this season. In the name of celebrating the NFL’s 100th season, the league will put its oldest rivalry in that Thursday night spot to start the regular season. The Chicago Bears and Green Bay Packers will kick off the 2019 season. For many years, the NFL has given the defending champions the opening week Thursday night game. As the NFL planned to release its full schedule on Wednesday night, that left the question of what would happen with the Patriots’ opener after they won Super Bowl LIII. Don’t fret New England, you still got a marquee matchup. 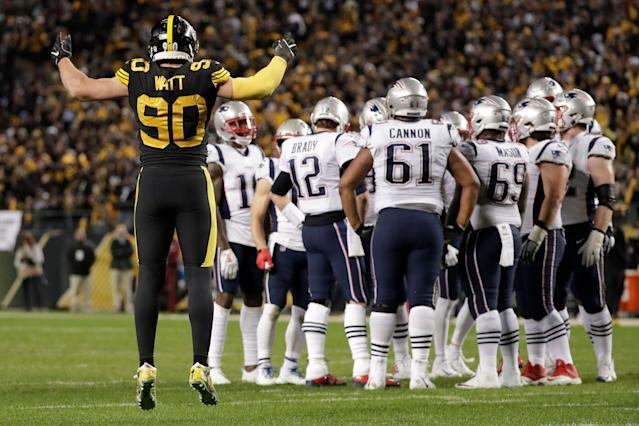 According to Nick Underhill of The Athletic and other reports, the Patriots will start the regular season on NBC’s “Sunday Night Football” against the Pittsburgh Steelers. That’s a great matchup between a Steelers team that doesn’t have Le’Veon Bell or Antonio Brown anymore but still has plenty of stars, and a Patriots team that keeps dominating the NFL. It’s a matchup that has historical significance too. The Patriots and Steelers are the only franchises that have won six Super Bowls. It would have worked fine as the traditional season opener because it would have fit the historic angle the NFL sought to begin its 100th season. Perhaps the league wanted something new, and the Patriots beginning defense of a Super Bowl title on a Thursday night has been done before. In addition to being a matchup between two of the NFL’s most popular franchises, they’re two teams with a lot of questions to answer. NBC’s ratings should do quite well. The Steelers got a taste of life without Bell last season as he held out. They traded Brown this offseason to the Oakland Raiders, and they’ll have to adjust. It will be a new look Steelers team with a lot to prove after a tumultuous 2018. The Patriots will retool too. Rob Gronkowski retired and a few key free agents left. Still, New England always seems to find a way. Patriots fans will have to wait a few more days to raise another banner and celebrate another Super Bowl. But they still get a pretty good showcase to start the season.